I’m getting into full on avocado mode here in LA because it’s ALMOST spring. Never mind the fact that I’m literally sitting here writing this blog post in a full puffer jacket… March is around the corner and let’s hope the 70 degree weather is coming with it! So while I fantasize of spring dinner parties outside, let’s make tostadas! These babies are made with my spicy refried bean recipe because ever since making that all those years ago, I’ve been making them in bulk and using them in just about everything! On top of the beans, I piled some charred corn, mashed avocado with lime juice and chives, pico and some spicy garlic sautéed shrimp. These are also perfect for entertaining! You can make all the toppings and set them out on your counter and let your guests create their own tostada creations. Whip up a few freshly squeezed margaritas if that’s your thing and call it a party! In a skillet, heat the oil over medium high heat until almost smoking. Add the tortillas into the oil, one at a time, and fry on each side for about 2 minutes until golden brown and crispy. Remove with tongs and set aside to dry on a paper towel. Repeat process with other corn tortillas. In a small bowl, place the avocado and chives and lime juice. Mash with a fork, season with salt and pepper and set aside. Toss the shrimp with the cayenne and garlic powder as well as salt and pepper. Sauté in a medium skillet with 2 tablespoons of oil for 2-3 minutes on each side until pink and cooked. Spread the 1/4 cup of refried beans on top of each tortilla. Spread a layer of the mashed avocado chive mixture on top. Finish with a few shrimp. mmmm, so fresh and summery! i love tostadas too…it’s been way too long since i made them! Gaby the photography is so vibrant. Love all the colors. Wow, looks sooo yum! MMM!!!! My two favorite things, shrimp and mexican food, how wonderful!! Eating as many avocados as you can? Tough job, but someone’s gotta do it 😉 Eating California Avocados is also helping our State economy, yay! Looks delicious. And what a great serving dish!! What a beautiful picture! This recipe sounds great! 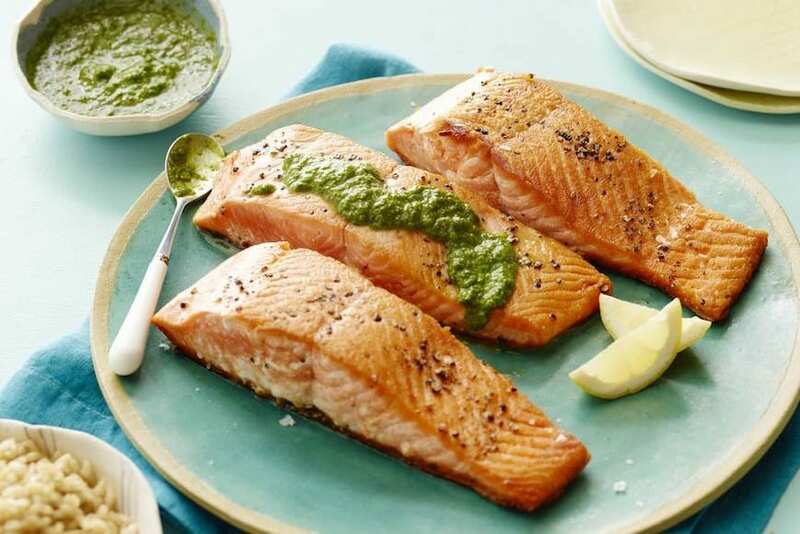 I recently got some Himalayan pink salt and organic peppercorns from Sustainable Sourcing https://secure.sustainablesourcing.com and I’ll have to try them out in this recipe. Thanks for sharing! OOOO, I’m definitely making these. Oh my, now this is a dish I can get behind. The grilled corn would add the perfect smoky flavor. One of my favorite restaurants here in Raleigh does great tostadas and these look very similar. 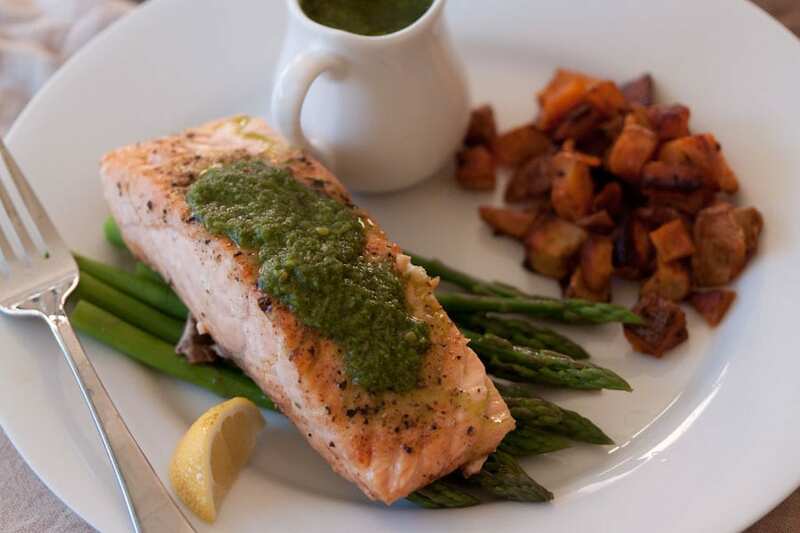 My mouth is now watering – yum! These look and sound amazing!!! I don’t have grapeseed oil though, any other oils that would work just as well? It’s been ages since I’ve made tostadas and these look fantastic! Definitely will have to make your spicy refried beans to go with them! Oh these are right up my alley. Looks SO good! This looks so good, I wish I had one for breakfast! 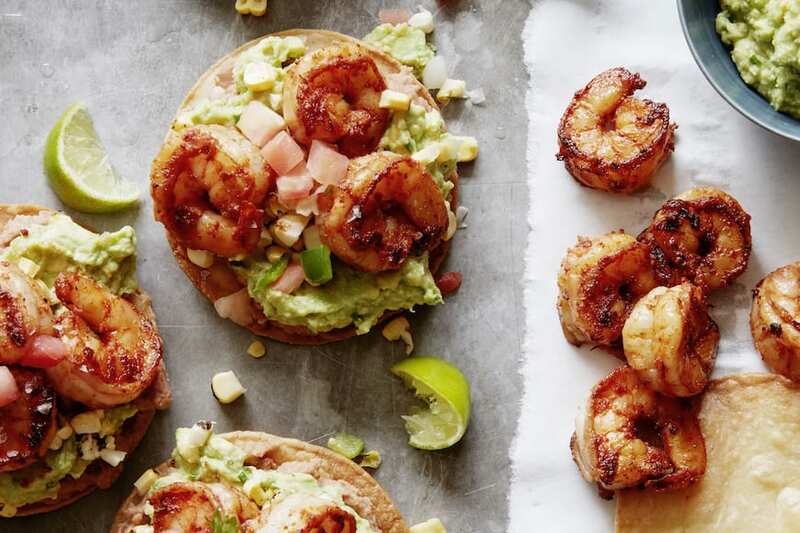 We actually just had some chicken and black bean tostadas for dinner earlier in the week – this shrimp and avocado version will definitely be next on our list! Those look so divine! Literally *everything* that I love! YUM! 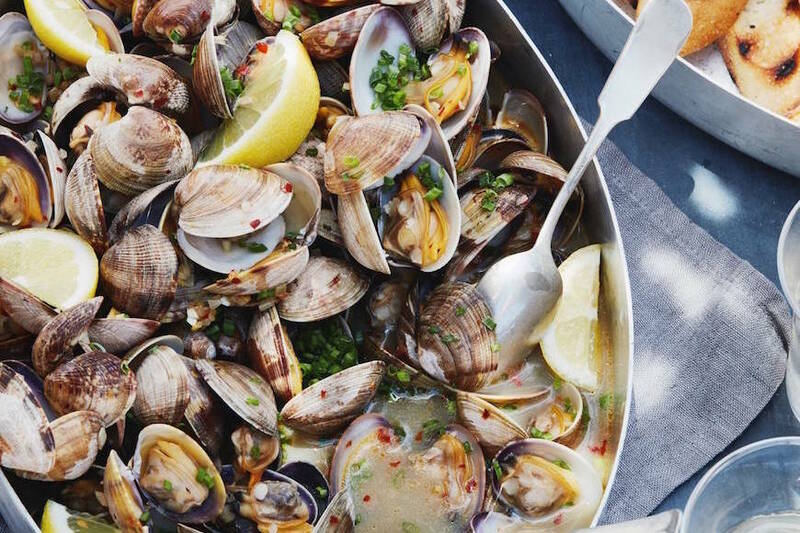 A perfect summertime recipe! Adding it to my to-try list for next weekend. We a lot in common in our kitchens! 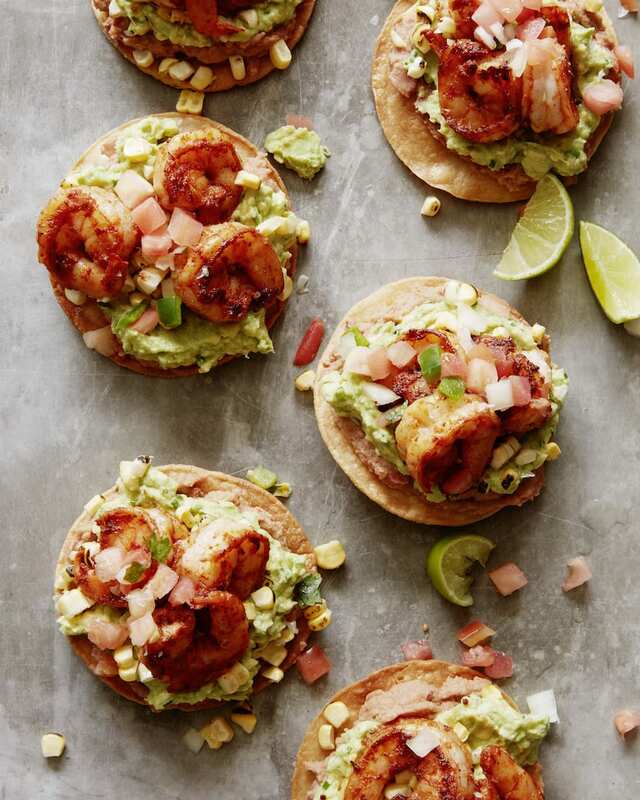 Shrimp on a tortilla = beautiful hot mess! 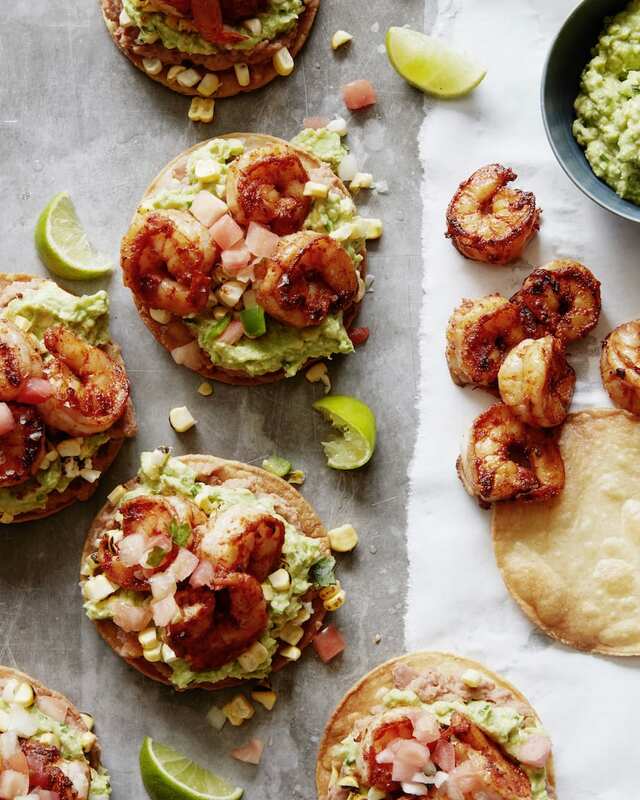 This may be our Cinco de Mayo dinner for tonight- looks amazing! Oh, yum! This looks super easy and super delicious! oh yum!! those shrimp look perfect and I love the idea of SPICY beans! Tostadas any way I can get them! Yes!!!! I’ve got to try these tostadas soon! YUM! Pingback: Weeknight Meal Plan || #3 - The Effortless Chic - A lifestyle blog bringing easy ideas for every day style to you, every day of the week! These are great! And totally adaptable for a weeknight meal. I microwaved the corn on the cob (no judging!) and then cut off the kernels and cooked them in my skillet. We put all of the fixings in bowls on the table and everyone made their own, just to their own liking. It was perfect!